In this photo I am 9 weeks. I am so excited to learn the genders. Twins was such a shock because at my 5 week ultrasound, there was only 1 sac so when I went back in and there was 2! WHOA! big shocker but we are so excited. I would like to know if they are identical or fraternal because I have read that they can still be identical with 2 separate sacs. I am unsure of where the placenta is. If anyone can point it/them out I would be so grateful. I don't go back to the dr for 2 more weeks and can't wait to see what she says! I am a mother of 14 mo old fraternal twin boys. 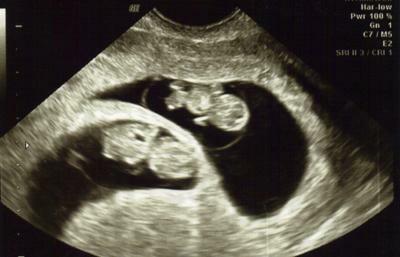 mine were both in seperate sacs with seperate placentas, however I was told they still had a chance of being identical and we wouldnt know until they were born. It all depends if you ovulated from both sides (two eggs) or if just one, when it splits will determine fraternal or identical. Good luck and I wish you the best! Twins are double the work, but double the love and double the fun!!! !